With sustainable economic growth so difficult to secure, ensuring that women realise their full business potential is critical to the UK economy. A study by Deloitte reported that around 1 million SMEs are women lead. This represents 20% of UK SMEs. These businesses contribute £85 billion in Gross Value Added (GVA) to the UK economy. However, only 5.7% of working-age women engaged in early entrepreneurial activity. Deloitte estimated that by 2025, women-led SMEs could contribute in excess of £180bn GVA to the UK economy were this proportion to reach 10%. Helping women to create their own businesses, to raise funding and to innovate is therefore pivotal to boosting the UK’s economy. Gender Equality is also high on the agenda of the United Nations’ Sustainable Development Goals (SDGs). These are challenges UN Members’ states are expected to achieve by 2030. The fifth SDG - entitled ‘Gender Equality’ - is explicitly aimed at achieving gender equality and empowering all women. 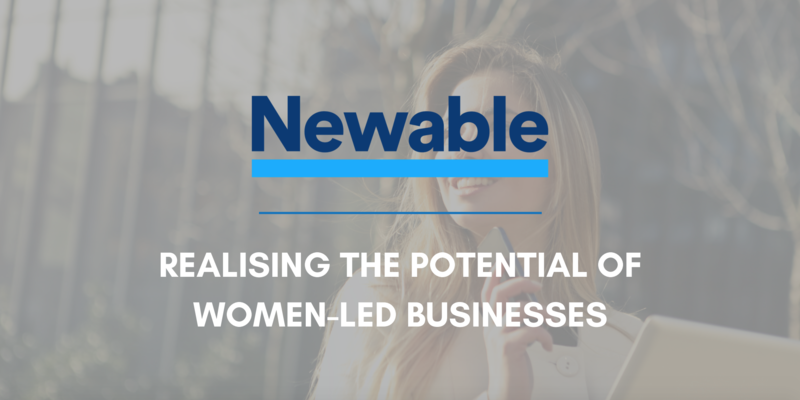 However, Newable’s first-hand experience of working with businesses at the heart of the economy shows that women are still confronted by many obstacles. This empirical evidence is supported by numerous research studies. A 2016 study by Innovate UK interviewed 200 female innovators. It established that securing funding was the main challenge for women entrepreneurs. The Global Entrepreneur Monitor documented that some perceptual factors such as self-confidence and fear of failure also depress the level of women’s entrepreneurship. Other challenges include a lack of role models, networking opportunities and, on occasions, experience in commercial risk-taking. Newable is the champion of business growth and strives to generate positive social impact through the promotion of inclusive economic activity. We are excited to be launching the Fuelling Ambition programme designed to make a dent in these issues and help female entrepreneurs realise the commercial potential of their businesses. The programme consists of one to one tailored support, workshops covering topics such a Dynamic Business Modelling, Breaking through Roadblocks to Business Success, Kick Starting International Sales and Making Your Business Investable. It also includes an investment pitching event. The highlight of the programme is a high profile conference taking place on Thursday 10th May, 9.00am – 6.00pm, at Milton Court, Guildhall School of Music & Drama, Silk St, London EC2Y 9BH. The Conference takes delegates on the journey from inspiration to investment, breaking through the barriers women entrepreneurs face along the way. The conference features stellar speakers such as June Saprong, Holly Tucker (Not on the High Street), Dan Cobley (ex MD of Google UK) and Jenny Tooth, CEO of UK Business Angels Association. Secure your ticket with an exclusive BFS discount here!